#1 App in the Google Apps Marketplace. Integrates with Google Apps and QuickBooks. Mavenlink is a better way to manage your projects with features designed to streamline workflow and increase team productivity. MavenLink can handle just about everything related to project management. Users can request and receive payments, build invoices, monitor project history, send email invitations, set team member permissions, schedule tasks, track project time and budgets, share files and view them instantly using Scribd technology. MavenLink seamlessly combines all of these vital project tasks into one application to cover virtually every aspect of project management. Mavenlink is a good fit for small enterprises without formal Project Managers on their staff. Its application provides a common sense approach to creating projects and tasks, scheduling, planning, and collaborating in order to complete a project. The secure project area provided by Mavenlink and its approach to email based project messaging ensures projects tasks are not overlooked and are fully visible to all project participants based upon user access rights. This application enables organizations to manage projects without hassle, thereby lowering administrative costs. A key differentiator for Mavenlink in the project management space is its tight financial integration (Pro Version). Smaller organizations that utilize remote workers can easily calculate sub-contractors time, project resources, project budgets and expenses without ever leaving the application. It is a tool that not only tracks and manages the project billing, but can also issue invoices directly from the application, which reduces overall administration and simplifies the accounting process. Go beyond project management and start managing your business. Collaborate on projects, enter tasks, track budgets, time & expenses and sync to QuickBooks with one click. Keep project and accounting teams aligned. Save time and avoid duplicate data entry. Mavenlink provides a central, collaborative workplace to track and complete projects. Time and expense management, budgeting, and file sharing all simplify workflow and increase productivity. 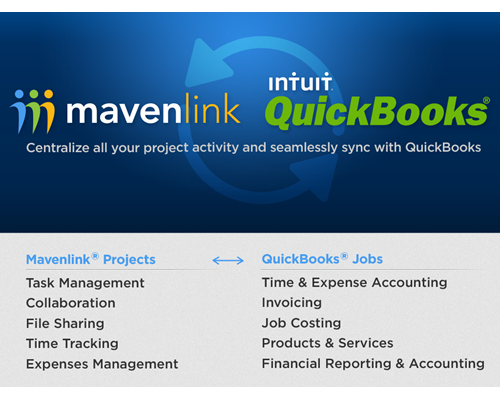 And of course, Mavenlink integrates seamlessly with QuickBooks. Mavenlink’s project workspace efficiently organizes tasks, deliverables, and milestones. Other features like real-time messaging, file sharing, and email integration are all handled within the platform. Monitor time and expenses on your projects. Track time across all projects and assign an hourly rate to entries. Manage projects & tasks, post messages, and record time and expenses from any Android device or iPhone. Upload multiple files to your private and secure cloud. Share large files with team members in any of your projects. Events, messages, and comments are integrated to your current email system from day one. You can use your email or mobile device to review and reply directly to messages from the workspace. Receive notifications as events happen, or choose to have them bundled the day’s emails (notes, tasks, deliverables, and milestones) into a nicely formatted digest email. You get all the benefits of an online centralized workspace, without any extra work.